Free Father Nguyen Van Ly! She Who Will Be Obeyed! V The K’s Caption This! The Washington Times reports that The House Oversight and Government Reform Committee, led by Rep. Darrell E. Issa is making inquiries into the Extortion 17 helicopter crash that killed 31 servicemen including 22 Seal Team 6 members. Questions haunt the families of Extortion 17, the 2011 helicopter mission in Afghanistan that suffered the most U.S. military deaths in a single day in the war on terrorism. The investigative file made available to The Washington Times shows that the helicopter’s landing zone was not properly vetted for threats nor protected by gunships, while commanders criticized the mission as too rushed and the conventional Chinook chopper as ill-suited for a dangerous troop infiltration. Every day, Charlie Strange, the father of one of the 30 Americans who died Aug. 6, 2011, in the flash of a rocket-propelled grenade, asks himself whether his son, Michael, was set up by someone inside the Afghan government wanting revenge on Osama bin Laden’s killers — SEAL Team 6. Doug Hamburger’s son, Patrick, an Army staff sergeant, also perished when the CH-47D Chinook descended to a spot less than 150 yards from where armed Taliban fighters watched from a turret. He asks why the command sent his son into Tangi Valley toward a “hot landing zone” in a cargo airship instead of a special operations helicopter. The souped-up choppers — the MH-47 and the MH-60 Black Hawk, which SEAL Team 6 rode the stealth version of to kill bin Laden — are flown by Night Stalker pilots skilled in fast, ground-hugging maneuvers to avoid detection. Read Rowan Scarborough’s entire report, here. Posted in Extortion 17, Regime. On July 24, radio talk-host Michael Savage interviewed Charles Strange, the father of Michael Strange, one of the 22 SEAL Team Six members who died in that Chinook helicopter crash in August of 2011. This was a momentous, blockbuster interview that seems to have gone unnoticed by most of the internet. After listening to this interview, I’ve concluded Benghazi isn’t the biggest Regime scandal. 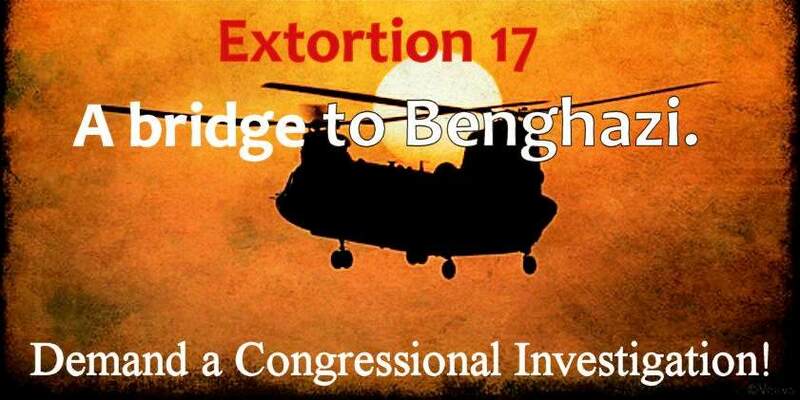 EXTORTION 17 is. – His son and his fellow SEALS knew “something was going on with the team”, and “somebody’s leaking things out”…. (besides Former CIA Director Leon Panetta and Vice President Joe Biden?) They knew “something was going on” and were putting their affairs in order. – According to Mr. Strange, Michael along with 8 other SEALS made it out of the Chinook and were fighting on the ground. – Mr. Strange stated that he was “100% sure” that the Regime had executed his son and the others on purpose. – Imam at ceremony at Bagram Air Force base condemned the men as “white devils” and “infidels”. – All the bodies were cremated. – Mr. Strange believes his phones are tapped. – Recently Michael Strange was awarded the Silver Star for valor. His parents were not invited to the White House for the Ceremony. After Vice President Joe Biden revealed that SEAL Team 6 carried out the operation that killed Osama bin Laden in May 2011, Strange said the members of his son’s team gave startling indications to their families they were about to meet their demise. Charles Strange, the father of slain SEAL Michael Strange, told Savage Wednesday night that in June 2011, on at least three separate occasions his son grabbed him by the bicep and announced that he had prepared his will. The bewildered father finally was able to find out what it all meant. Jason Chaffetz (R-Utah) is leading the Congressional investigation into the helicopter crash. Did the Obama administration put a target on the backs of members of Navy SEAL Team 6? This is the question that parents of slain SEALs are now asking — and rightly so. Forget Benghazi, the IRS, Eric H. Holder Jr. and the National Security Agency spying on U.S. citizens. Important as these scandals are, what happened to SEAL Team 6 could very well dwarf them. Our government betrayed America’s finest warriors. Hat tip: Before It’s News. Led by Jason Chaffetz (R-Utah), Congress has launched an investigation into the helicopter crash that killed 30 Americans in Afghanistan, including members of the Navy’s elite SEAL Team 6, two years ago. The victims’ families say the Pentagon hasn’t provided answers to their many questions about the deadly attack, which took place on Aug. 6, 2011, three months after Osama bin Laden was killed in Pakistan by Team 6 forces. Chaffetz said he met with the victims’ families about a month ago in what he described as an “emotional” gathering. He is poised to send questions to the Pentagon and may hold hearings on the matter. Charlie Strange, whose son Michael was among those killed, said he asked President Obama two years ago at Dover Air Force Base to fully investigate. The death toll in the crash was the largest of any single incident for the U.S. military during the Afghanistan war. Karen and Billy Vaughn, the parents of Aaron Vaughn, appeared on America Live with Megyn Kelly to talk about the investigation. The sacrifice of our special ops forces leaves our our country, our families, and our homes unsafe! Our son, Special Operations Chief (SEAL) Aaron Carson Vaughn (DEVGRU), was one of America’s most elite warriors… one of the 300. He was engaged kinetically in theGlobal War on Terror and his heart beat passionately for the republic he loved. On 6 Aug, 2011 he, along with 29 other rough, fearless, American warriors, stepped into a CH-47DChinook chopper in the black of night and headed to a mission from which they would never return. As we began searching for answers, our eyes were opened to vile atrocities being played out on America’s military. We quickly came face-to-face with our worst nightmare…our boys shouldn’t have died that night. The downing of Extortion 17 was at best unnecessary and at worst a negligent, reckless loss of life. Political games, criminal Rules of Engagement and Washington’s total, wanton lack of regard for the battles our fearless warriors face on a nightly basis finally culminated in the greatest one-day loss of life in the history of Naval Special Warfare. If these atrocities had ended on August 6, 2011, our battle would never have begun. But multitudes since have breathed their last –at the hands of the same disgusting lack of regard and/or criminal behavior. Our defenders deserve to be defended. The burden of their covering rests on us, the patriots of this nation. It is imperative that we stand together and demand change. Although we cannot be engaged in this war kinetically as Aaron was, we must be engaged culturally. We are fightingthe fight and we need your help. Posted in Corruption, Disaster, Enough!, Extortion 17, ObamaFAIL, Regime. Definisi Quick Count dan Exit Poll Pemilu dan Pilkada Indonesia on DON’T LISTEN TO THE EXIT POLLS, TODAY! belanwalibahu on Hillary Clinton: Crazy, Pscho Ex-Girlfriend, Or Crazy Like A Fox? Your Easter Sunday Hymn: Jesus Christ Is Risen Today! Saturday Movie Matinee: Where's Putin? Alriiiight Awesome Commies Corruption Deesgusting Dems Dumb! Enough! FAIL Fox News GWOT Holder Huh! Islamofascists Lyin' Weasels News You Can Use Obamacare ObamaFAIL Obamessiah Really??? Regime Repubs Sad but true Saturday Movie Matinee Stuff Sunday Hymn Tea Party Uhhhh Watcher's Council WOW!